[Keaton] provides the most in-depth analysis of the predicament of French Arabs and Africans living in the suburbs of Paris.... [O]ne can read the book through the lens of such great African American writers and activists as Richard Wright, James Baldwin, and Malcolm X.... [It] contains an implicit warning to you, France, not to repeat the American racism in your country." 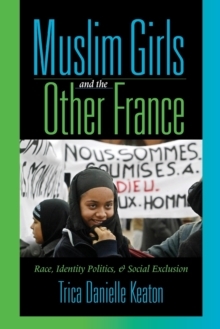 -from the foreword by Manthia DiawaraMuslim girls growing up in the outer-cities of Paris are portrayed many ways in popular discourse-as oppressed, submissive, foreign, "kids from the projects," even as veil-wearing menaces to France's national identity-but rarely are they perceived simply as what they say they are: French. Amid widespread perceptions of heightened urban violence attributed to Muslims and highly publicized struggles over whether Muslim students should be allowed to wear headscarves to school, Muslim girls often appear to be the quintessential "other." In this vivid, evocative study, Trica Danielle Keaton draws on ethnographic research in schools, housing projects, and other settings among Muslim teenagers of North and West African origin. She finds contradictions between the ideal of universalism and the lived reality of ethnic distinction and racialized discrimination. The author's own experiences as an African American woman and non-Muslim are key parts of her analysis. Keaton makes a powerful statement about identity, race, and educational politics in contemporary France.